My house if full of nothing but boys. Because of this, it is also full of hundreds upon hundreds of cars. No, I am not exaggerating. My 6 year old has been obsessed with Hot Wheels die cast cars since he was about two and he has since collected over 400 cars! Always being up for the latest and greatest car toys, he was thrilled when we received a box containing the new Hot Wheels Double Dare Snare track set. 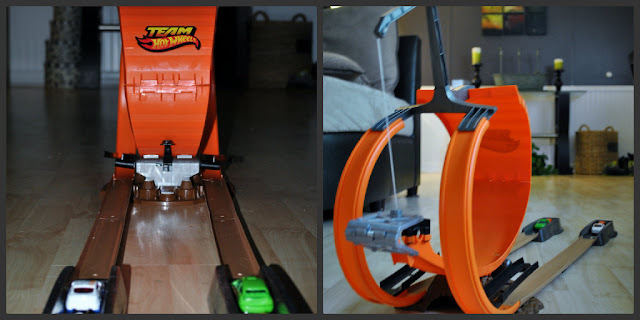 "Double Dare Snare allows boys to race 1:64 scale Hot Wheels side by side, down a twisty track, through a hair-raising loop and over a jump at the edge of a steep canyon. Inspired by the real life crew of Team drivers, this daring stunt set proves that two vehicles are better than one." We were given the chance to review the Hot Wheels Double Dare Snare set as well as three new Team Hot Wheels cars. If you have boys, you know the look on their face when they see that toy box. The wide-eyed "I can't wait to get my hands on this" excitement is almost too much to control and they hop around the room excitedly waiting for you to figure out how to put the toy together. Luckily, the Double Dare Snare set comes with a minimal amount of assembly required and best of all, no batteries are needed! This is a huge plus for me. After just a few minutes of looking at the step by step picture instructions, we had the track setup and ready to race. I was pretty impressed with the fact that everything fit together easily and there was no hammering, screw driving or other painstaking techniques needed for assembly. The track also stayed together well after several rounds of play, a problem we have had with other brands of tracks in the past. The track is really easy to operate and would work well even for younger children. It really is as simple as 1,2,3. All you have to do is clip on the rescue pod, press down the button to set the ejection ramp for a fair start to the race and then each racer just has to time their buttons right in order to eject their car from the ramp and win! While the track is simple, it is also tons of fun! The boys played with it for an hour easily and still were begging for more when it was time for lunch. The thing that makes this so great is that it is not a one person toy like most car track sets, it is a race set. So, you can have fun trying out different sizes and types of cars against each other to see which one will go faster. The boys quickly learned that the van did not go nearly as fast on the track as the slower cars. After the fun they had with the Hot Wheels Double Dare Snare, it was time for some "car themed" lunch. 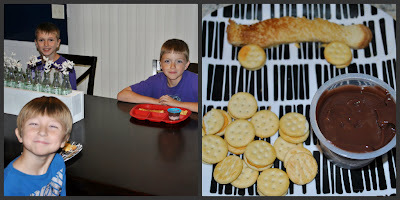 We had race car shaped grilled cheese sandwiches with tire shaped crackers and "oil slick" chocolate pudding. Want the chance to see something completely awesome? On Saturday June 30th at 11:20 PDT, Hot Wheels will be bringing the Double Dare Snare tack to life at the X Games in Los Angeles! 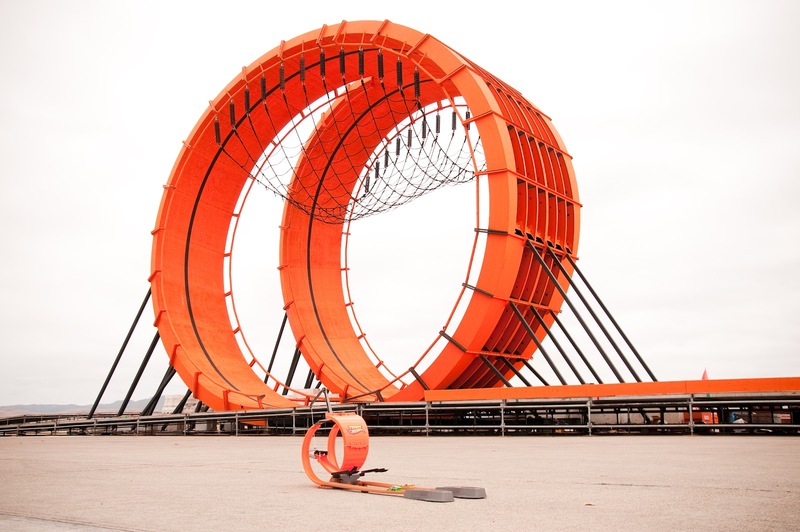 You can watch the Hot Wheels drivers go head to head on the life sized track on ABC. Catch a sneak peek below and be sure not to miss it on TV. You can purchase the Hot Wheels Double Dare Snare set for only $21.99 on the Matell Shop and now through July 1st, you can receive a special FREE gift when you make a purchase online. I want to win this for my grandsons because they love cars and would love seeing how fast they go on the ramps! I want to win this for my nephew so I can put it up as a Christmas gift for him because otherwise we aren't going to be able to exchange gifts this year! I would like to win because my son is a Hot Wheels fanatic. With three boys, there are never enough cars in our house! My son would love this he loves hot wheels. I've got two boys and I would save this for Christmas! I loved me some Hot Wheels growing up. Great giveaway. My son is completely obsessed with everything Hot Wheels. This is fantastic! I would like to win this because my nephew (4 years old--5 in December) loves cars, and he would be so excited to play with this set! At last count Tristan had 43 Hot Wheels vehicles. This track ewould provide hours of fun for him. Would love to win this for my son! He would love it and play with it all day! I would love to win this for my son, he loves Hot Wheels. I want to win for my son because he loves to play with Hot Wheels! I'd like to win it for my boy. He is surrounded by girls (4 of them) my oldest son is leaving to scout camp and my youngest boy is not happy at all about being stuck in the house with girls. The heat is unbearable here so we are having to find indoor things. This is actually my third tweet of the day, I'm not sure why my comments disappear :( This happened yesterday as well. I want to win b/c my son was playing with this hot wheels set a friend's house and loved it. He has been begging me to buy it ever since. It's on his Christmas list but I'm hoping to win it for him so that he can play with it this summer! I would love to win this for my son, who is a hot wheels fanatic! My son collects hot wheels cars he would have so much fun with this!! I'd love to win this because my nephew would enjoy it. I want to make my little guy happy. i want to win this for my little boy,he would just love this!!! I would love to win this for my little grandson. He loves Hot Wheels. So my son and I can play with it. I would like to win this for my little grandson to play with when he visits Grandma. I would love to win this because my grandson would have so much fun playing with it! This would be great for grandson's Birthday.